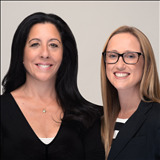 Jodi and Joanna have lived and worked as a real estate team in the Short Hills area for almost 20 years and even starred in an HGTV show together. Legend has it that they shared a room on the maternity floor of Mount Sinai Hospital in Manhattan when their first daughters were born. After meeting each other again at Gymboree classes with their girls, they quickly became fast friends and Jodi was intent on getting her new friend to hit the burbs with her growing family. Jodi took almost a year to find a home and before moving out of the city, she orchestrated her first NJ real estate deal by telling Joanna to, " just look" at three homes for comparison's sake before committing to a potential move to Brooklyn. Joanna fell in love with the area and unexpectedly bought one of those three houses that first day. Shortly after moving to New Jersey, Jodi and Joanna developed a strong interest in real estate and the idea of helping others make the move to the suburbs was certain. After all, if two die-hard New Yorkers could find happiness in the burbs, they knew they could help guide others to find their happy place in New Jersey. Through Jodi and Joanna's years of hard work, fierce honesty, passion and humor, this dynamic duo has helped numerous clients achieve their real estate goals and have made life-long friends. They believe that two heads and better than one and they stand by the motto that they are Realtors for life. Jodi and Joanna are driven by a need to make the towns they live and sell in better places and are active members of the community. With very different yet complementary styles, they share a strong work ethic that makes them the ideal team for buyers and sellers. As skilled negotiators and passionate local leaders, their team will guide you through your next real estate adventure. Jodi and Joanna were honored to be featured in several seasons on the weekly hit HGTV show, Bought and Sold, which showcased them on national television and provided an honest perspective on the real estate process from the start to finish.